For other uses, see Brande (disambiguation). Until 1 January 2007 it was the seat of the municipal-council of Brande municipality. Brande is the home of leading wind energy pioneer Bonus Energy A/S now Siemens Gamesa Renewable Energy. Brande is also home to Danish clothing companies Bestseller A/S and BTX Group. A large building project is in its early making in Brande. Bestseller wants to create a new quarter Bestseller Village & Tower with housing, business park, hotel, education area etc. in the north-eastern part of the town, and the centre of the quarter will be a new high-rise building called Bestseller Tower (Danish: Bestseller-tårnet) which will be a 320 metres tall skyscraper. Thereby it will become the second-highest sturcture in Western Europe, surpassed only by the 324 metres of the Eiffel Tower; it will be the tallest building, 10.4 meters taller than the Shard in London. The project was approved in March 2019 by Ikast-Brande Municipality, and is expected to be completed in 2023. The mural paintings in Brande has made the city famous for its decorations and art in public spaces. In 1966, doctor Ole Bendix and lawyer Jørgen Mansfeld-Giese initiated the creation of the first mural paintings. The art association "Midtjysk Kunstforening" was established in the old Askjær School and marked a new phase in the history of Brande cultural scene. The purpose of the organisation was to arrange special events within art, music, theater and film. Initially, the number of members reached 600, both from Brande and the surroundings. The mural paintings were one of the first projects and the goal was to create a gallery atmosphere in the open space without fixed opening hours. Art should be accessible for everybody in their daily life and form the basis of debate and inspiration. Statens Kunstfond (Danish National Art Fund) supported the project, and artists started moving to Brande. 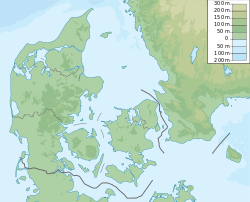 The citizens were skeptic at first, but the mural paintings had put Brande on both the national and international map, and further to this, Brande was elected as the Danish city of the year in 1969. New mural paintings have been created during the years, some have been carefully restored and others have unfortunately disappeared due to new constructions and wear and tear. These are just some of the names of the mural paintings. Joy of life is made by the Finish artist Jorma Kardén decorating the library in Brande. Acrobat fantasy is created by K. Bjørn Knudsen and is visible at the old town hall in Storegade, Brande. Spines is painted by Claes Birch and can be seen in Borgergade. This special initiative in 1966 has for sure formed the basis for the art interest among the population in and around the city of Brande. Many passionate people have throughout the years established creative and challenging projects, like the worlds largest carpet "The Brande Carpet", which was 275 m long and 4.80 m wide. The carpet was made by 3000 pieces of painted tissue. In 1981, a number of new artistic signals were initiated in the streets. The sculpture "Æ soikers kårner" was built at the 100 years anniversay of "Brande Håndværker og Borgerforening" (local association for shops and handcraft). In 1991, the "Kultursmedjen" was inaugurated, the city had a culture bus and the first culture caravan travelled to Eastern Europe. In 1992, Birgit Vinge Nielsen initiated a huge multimedia show in the old engine shed called "Drømmerejsen" (The dream journey). Birgit Vinge Nielsen has with energy and power established a large number of activities within art and culture in our area. Also an international workshop with artist from all over the world has taken place for many years in the old engine shed buildings. The workshop has now moved to Gludsted School. Some of the works of art still decorate Brande. Sportmaster in Brande has entered into a cooperation with some of the artists, and several paintings are visible outside the shop to the delight of citizens and tourists. The old engine shed is now professionally restored and form the basis for conferences, concerts, talks and exhibitions. “Art in movement" is one of the latest projects taking its starting point in Brande and the association "Kulturremisen". International artists stay for a certain period in a small village in the region to develop a permanent work of art in cooperation with the citizens. This project will cover both 2012 and 2013. The tourist organization offers guided tours for both smaller and large groups among the mural paintings in Brande. The International Street Art Festival in Brande during the summer of 2015 and 2016 was a huge success, and it is planned to continue as a yearly event. In 2016, 19 professional street artists decorated the city square, streets and a new beautiful wall. All the activities attracted lots of guests in the festival weekend – and still many guests and tourists visit the area to see the colourful street art paintings. ^ "Population 1. January by urban, rural areas (DISCONTINUED) - StatBank Denmark - data and statistics". www.statistikbanken.dk. ^ "Merger of Siemens Wind Power and Gamesa". www.siemens.com. ^ "BTX Group » Skandinaviens største leverandør af modetøj «". BTX Group. ^ arkitektnytt.no (11 September 2018). "Vil bygge høyest i vest". arkitektnytt.no. ^ "'Like the Eye of Sauron': western Europe's tallest building planned for tiny Danish town". The Guardian. 1 April 2019. Retrieved 13 April 2019. a 320-metre skyscraper ... the tallest building in Denmark, but the tallest in western Europe, besting the Shard in London by a crucial 10.4 metres. ^ "Borgmester: 320 meter høj bygning bliver et stort aktiv". RetailNews. ^ "Dansk rigmand vil opføre by i Jylland - og den skal have Vesteuropas højeste tårn - TV 2". nyheder.tv2.dk. 10 September 2018. ^ "Äänekosken kaupungin ystävyyskuntatoiminnan edistäminen" (in Norwegian). City of Äänekoski. Archived from the original on 19 July 2012. Retrieved 1 June 2012. Wikimedia Commons has media related to Brande.